Each year the CEE network trains about 55,000 teachers who serve over 5 million students, about 10% of the nation’s students. More course requirements will result in more teachers trained and more students leaving school ready for the decisions they face in college and careers. Only 17 states require a course in personal finance for high school graduation, and nuonly 7 states require testing of personal finance concepts. Less than half of the states, 20, require a course in economics for high school graduation, and only 16 states require testing of economics concepts. The Survey of the States provides a clear picture of why advocacy is need. Our Goal: High school course requirements in economics and personal finance in all 50 states and the District of Columbia. In a basic sense, advocacy is educating the public, including elected officials. Advocacy can be as simple as sharing the demonstrated success of your programs along with explaining the need and demand for your services. Every CEE affiliate can and should be an Advocate for Economic and Personal Finance Education. Educating plus the Ask: When advocacy moves from educating the public to asking for support of specific legislation or funding from a government body it becomes lobbying. If your position prohibits lobbying, you can still advocate for more and better economic and personal finance education. You can also serve as a resource for elected officials and provide them with information they need to make educated decisions about any legislative decisions they face. Non-profit organizations can legally engage in lobbying. It is best practice to engage your board of directors before embarking on any major lobbying efforts. The 1976 Lobby Law clarified the extent to which non-profit organizations can engage in lobbying without jeopardizing their tax-exempt status. The Independent Sector provides a good overview of the laws and regulations surrounding lobbying by non-profits in The Nonprofit Lobbying Guide Second Edition Chapter 9. Direct Lobbying – refers to attempts to influence a legislative body through communication with a member or employee of a legislative body, or with a government official who participates in formulating legislation. Grassroots Lobbying – refers to attempts to influence legislation by attempting to affect the opinion of the public with respect to the legislation and encouraging the audience to take action with respect to the legislation. Your 10-Step Plan (from the National Council on Social Studies Advocacy Toolkit) There are many approaches to advocacy planning, but here is a 10-step process that will help assure success. A council or group of local teachers who want to move forward on this campaign should take the time to tailor this plan accordingly. Identify an Advocacy Challenge or Opportunity. Find Out What Those Audiences Currently Know or Perceive. Determine How Each Audience Receives Its Information. Establish Measurable Objectives for Each Audience. Define Message Points for Each Audience. Determine the Communication Activities To Deliver Those Messages. Decide What Resources Are Necessary To Complete Each Activity. Establish a Timeline and Responsible Party for Each Activity. Evaluate Whether You Have Reached Your Objectives. This sample plan will guide you through completing the 10-step process. The most important step is number six where you determine the specific messages you want to share. Remember: message points should be clear and few. Advocacy Challenge: To convince the school board or legislature to require coursework in economics and or personal finance, including testing. An article on the value of economics and financial literacy will be published in the state school board association journal. Eighty percent of the Board will attend a seminar conducted by local social studies educators. Eighty percent of the Board will attend a social studies class in a local school. Bring the state social studies specialist to meet with the school board. Economic and Financial Literacy is more important than ever. Economic and Personal Finance education creates knowledgeable citizens and future workforce members. It is only by acquiring economic and financial literacy that children can learn that there are better options for a life well lived, will be able to see opportunity on their horizon line and, ultimately, can grow into successful and productive adults capable of making informed and responsible decisions. Prepare a cover letter and send a copy of the CEE Survey of the States, CEE Voluntary National Curriculum Standards in Economics and Personal Finance and performance expectations. Make a follow up phone call to assure it was received. Submit an article to the state school boards association. Deliver an invitation (written or verbal) to an information session, conference or training event. Develop a plan with the schools to have board members observe an economics or personal finance classroom. Deliver an invitation (written or verbal) to participate in the observation. Time to compose and disseminate the letters. Indicate completion time for each activity. When working with the state legislature, make sure that your timeline coincides with the legislative calendar. Do they express an interest in the expanding economics and personal finance education across the state? Do they go on the observation? Have you identified one or more champions for the cause? Has a board of education rule or a legislative bill been proposed? Whatever form of advocacy you are engaging in, you need to have a solid fact base to support your claims. Through the print and interactive versions of the Survey of the States, CEE provides the basis for your case for support. Your local programs will fill out your case, highlighting success stories of local teachers and students whose lives have been changed through economic and personal finance education. How many teachers and students directly participate in your programs each year? How many additional students are reached by teachers participating in professional development programs? What percentage of the schools you are working with are Title I schools? What percentage of teachers show an improvement in understanding of basic economics or personal finance concepts after participating in a program? CEE has compiled research from top industry experts and points of impact useful for making a case for the need for economic and financial literacy education in the classroom. You can find links to several of these studies on our Research and Impact page. Classroom Visits: Invite elected officials to visit classrooms and see teachers and students in action. This provides an opportunity to highlight an exemplary classroom program and teacher while showing why it is important for all students to learn the basics of economics and personal finance. Student Competitions: Invite state school board members and elected officials to local and regional student competitions as judges or guests. Make sure that press are also present to have photos and reporting on the involvement of these decision-makers. Teacher Workshops: Invite state school board members to participate in or observe a teacher professional development program. Utilize the state and local school boards as an outlet to reach more teachers. Award Dinners/Ceremonies: Invite state school board members, local and state level elected officials, and members of the U.S. Congress to your awards ceremonies. Honor a state level leader as a champion. This could be the State School Board Chair, the Chief State School Officer, the governor, a member of the state legislature, or a member of U.S. Congress. Request letters of recognition from elected officials for any teacher or student award recipients. Teachers who have been through your training programs are a great resource for promoting the goal of more economic and financial education in the classroom. They can provide real life examples of how these courses have helped their students face decisions outside of the classroom. Very often, elected officials love to make classroom visits and meet with their teacher constituents. School Districts: Boards of Education and Superintendents are involved in the decision-making process of how requirements will be implemented. Provide resources to them and examples of how the district can work with your council or center to develop and implement a curriculum. School Districts who have embraced a strong curriculum can be used as showcases, and leaders should be identified as champions to write op-ed pieces in support of economic and financial literacy education. In general two approaches have been taken in establishing state level mandates for course requirements, either through the State Board of Education or through the State Legislature. Whichever approach you choose, you should establish strong partners in both state bodies to build broad support for your efforts. State Board of Education: The State Board of Education will be involved in the writing and passage of rules related to curriculum, course requirements and testing throughout the state. The National Association of State Boards of Education provides an online directory by state. Chief State School Officer: While many of the curriculum decisions may be made at lower levels, such as the Social Studies Director, it is best to start at the top and establish a relationship with the Chief State School Officer. The Council of Chief State School Officers provides an online directory of the Chiefs. A best practice across the network is to have a standing seat on the state council’s board of directors for the current chief state school officer. State Treasurer: In many states, the Office of the Treasurer plays a leading role in Financial Literacy education. Here again, you should start at the top and engage the Treasurer with information about your programs as well as work with other officials in charge of specific initiatives. The National Association of State Treasurers has contact information available for each state. A best practice across the network is to have a standing seat on the state council’s board of directors for the current state Treasurer. State Legislature: If you plan to pursue a legislative route, it is imperative that you have a strong supporter within your state’s legislature who will work with you on the language of the bill and make sure that the content is meaningful for teachers and students. Establish contacts with the chairs of all education committees and subcommittees. Offer to provide testimony at hearings on education and professional development issues. Attend hearings and information sessions on legislation related to education. Engage your board member who may have personal connections to these elected officials. A best practice for all elected officials is to reach out to them before they are elected and make sure they know who you are, what you do, and why it is important. CEE schedules regular meetings in Washington, D.C., to address education issues with particular respect to economic and personal finance education. Our staff and consultants meet with members of the U.S. Congress, the U.S. Department of Education, the Consumer Financial Protection Bureau, and the U.S. Treasury, among others. 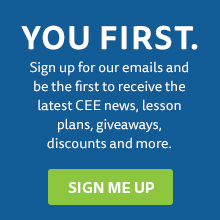 Get some ideas from the CEE Blog entries, the CEE Report, and past press releases. To help guide state leaders considering new or improved course requirements, we have included resources for researching current legislation and rules for economic and financial literacy education. The Survey of the States provides an overview of the current requirements in Economics and Personal Finance across the nation. The interactive companion site, www.surveyofthestates.com, contains an interactive map showing how the landscape has changed since 2002 and includes state-specific links to current policy for standards and course requirements in economics and personal finance. The ECS State Education Policy Database is a unique resource—currently summarizing nearly 40,000 pieces of enacted legislation—searchable by state, by year, and by issue. Here you can find up-to-date information on legislation and rules concerning Financial Literacy and Economics Education. This database is made possible by your state’s fiscal support of the Education Commission of the States (ECS), a nonpartisan and nonprofit research agency. Most entries are legislative, although rules/regulations and executive orders that make substantive changes are included. Every effort is made to collect the latest available version of policies; in some instances, recent changes might not be reflected. Georgia is one of only a handful of states that has required standards, courses, and testing in both economics and personal finance. Standards: Georgia has economics and personal finance standards embedded within their K-12 social studies standards and also specific standards for the required high school economics course. High School Course Requirement: According to State Board of Education Rule 160-4-2-.48, students are required to take a semester-long course in economics in high school. That course covers both economics and personal finance topics. Testing: Economics and personal finance are tested in Georgia as part of the Georgia Milestones Assessment System. Students in grades 3-8 are required to take an end-of-grade assessment in social studies, and students at the high school level are required to take an end-of-course assessment in Economics/Business/Free Enterprise. Indiana has required standards, courses, and testing in economics, and required standards in personal finance. Standards: Indiana has economics embedded within their K-12 social studies standards and separate financial literacy standards. House School Course Requirement: The “Core 40” diploma is the default diploma for high school students. The list of courses that are required include a semester-long course in economics. Testing: Economics is tested in Indiana as part of the Indiana Statewide Testing for Educational Progress Plus (ISTEP+) program. At grades 5 and 7, economic concepts are tested as part of the required social studies assessments. New Hampshire has required standards and a high school course which covers both economics and personal finance; there is no statewide standardized testing of these subjects. Standards: New Hampshire has economics and personal finance standards embedded within their K-12 social studies curriculum framework. High School Course Requirement: New Hampshire requires students to take a semester-long course in “Economics, including personal finance” for high school graduation. New Jersey has required standards in economics and personal finance, and a high school course which covers both economics and personal finance; there is no statewide standardized testing of these subjects. Standards: New Jersey has economics standards embedded within their K-12 social studies standards and personal financial literacy standards as part of their 21st Century Life and Careers framework. High School Course Requirement: According to the New Jersey State Administrative Code (N.J.A.C. 6A:8), every high school student is required to take at least 2.5 credits in “financial, economic, business, and entrepreneurial literacy,” effective with the 2010-2011 grade nine class. This 2.5-credit requirement addresses two key areas: personal finance and economics, and guidance for the course work that satisfies this requirement is outlined in Standard 9.2, Personal Financial Literacy. The requirement can be met by completing a standalone, half-year course or by completing one or more elective courses that integrate the content and skills required. Oklahoma has no requirements in economics but has personal finance standards that are required to be taught. Standards: Oklahoma has economics standards embedded within their K-12 social studies standards. According to the “Passport to Financial Literacy Act,” personal financial literacy education is required to be taught in all public schools. Beginning with students entering the seventh grade in the 2008-2009 school year, in order to graduate from a public high school accredited by the State Board of Education with a standard diploma, students must fulfill the standards articulated for a personal financial literacy passport. There is not a specific course requirement or duration that’s mandated for meeting these standards; implementation is left up to school districts. Utah has required standards in economics and personal finance, and a mandated high school personal finance course with required statewide testing. Standards: According to Utah Code Title 53A Chapter 13 Sections 108 and 110, students are required to master a specific list of financial and economic literacy concepts in kindergarten through grade 12 in order to attain a financial literacy passport. The Utah State Office of Education has provided a suggested scope and sequence for addressing that list of prescribed topics in grades K-12. High School Course Requirement: According to Utah’s high school graduation requirements, students must take a one-semester course in General Financial Literacy. Testing: Utah requires schools to administer an online, end-of-course assessment to students who take the general financial literacy course (see Utah SB 40). Virginia has required standards in economics and personal finance, and is one of only three states in the country (the others being Alabama and Tennessee) that requires a semester of instruction in BOTH economics and personal finance. There is statewide standardized testing of economics but not personal finance. Standards: Economics standards are embedded within Virginia’s History & Social Science standards, and Virginia has specific Standards of Learning for Economics and Personal Finance for the required high school course. Course Requirements: Virginia’s graduation requirement for economics and personal finance was implemented by the Virginia Board of Education. In 2008–09 it reviewed Virginia’s graduation requirements and included a requirement for students to earn a full credit in economics and personal finance as a condition to graduate. The requirement was implemented for students who entered the 9th grade in 2011–12. Students may take a full-year course in Economics and Personal Finance or separate semester courses in each. Testing: In middle school Civics & Economics is assessed as part of Virginia’s required History and Social Science Standards of Learning (SOL) tests. The documents listed below provide additional resources and policy recommendations which can be used in support of your advocacy efforts. Additional resources can be found on the Industry Data page. The CFPB created a resource guide to help connect policymakers with tools, information, and insights to enhance K-12 financial education efforts. The guide is targeted at policymakers but was designed to benefit all members of the financial education community. The purpose of this white paper is to outline how the ongoing struggle of many consumers to manage their finances can be mitigated in the future by focusing specifically on youth financial education. The CFPB proposes a comprehensive strategy to impart personal financial-management skills to young people while they are in school. The CFPB is focusing on school-based financial education policy for two reasons: first, most Americans are poorly prepared to make informed financial decisions; second, school-based financial education has the potential to reverse the current trend of poor financial preparation for future generations of American consumers. The full Council reviewed, discussed and unanimously approved 15 recommendations to the President and the Secretary of the Treasury. A brief summary of each of the recommendations is found in Appendix B (and more detailed explanations of each are elsewhere in this report). The recommendations share a common element: they acknowledge that financial capability is not a “stand-alone” topic to be isolated from the rest of our lives. Financial capability must be woven into the fabric of our lives – into our homes, our schools, our workplaces, our communities, even the design and regulation of the products we use.